Andy moved to our barn in mid-November. He’s a handsome older gentleman with a kind, sensitive face and a soft eye. His demeanor belies his size — he’s bigger than Zelda, probably a solid 17″ hands, but he has gentle, almost timid vibe. Andy is impeccably behaved when you are feeding him or working around his stall. So who knew that behind this facade he has a secret: he steals blankets. The first time I found my quarter sheet in his stall I figured I’d left it in the wrong place; had tucked it over the blanket bar on his stall. 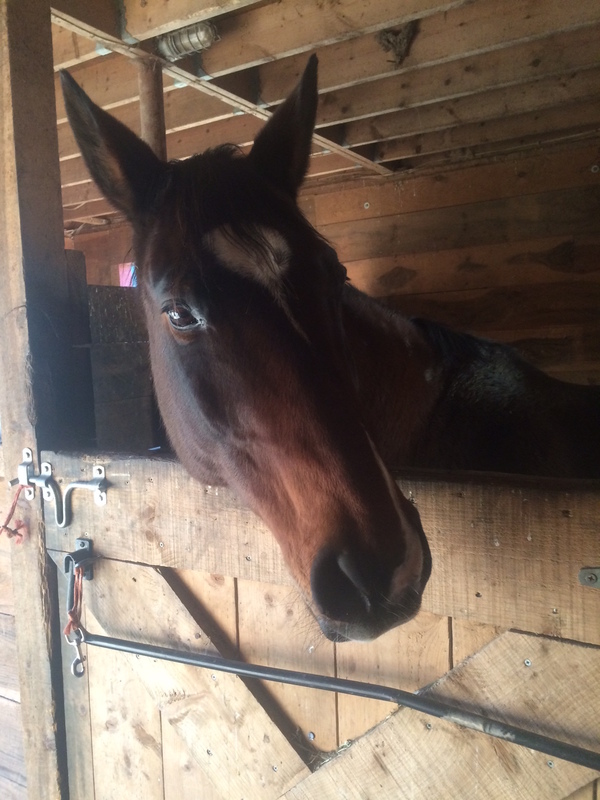 The second time I found his winter blanket in his stall, I again chalked it up to human error. Call me a slow learner, but it wasn’t until the third time, when I found Zelda’s blanket in his stall that I realized Andy was using his height and impressively long neck to snag the blankets off the door to the hay closet and drag them in with him. This is not a simple task — Zelda’s blanket is heavy. I imagine it took quite a lot of strength, determination and dexterity to free it from the door, lift it across the aisle and drag it into his stall. This is, most certainly, a talent that required a lot of practice. Andy doesn’t wear a blanket unless it’s really cold out. Maybe we should give him one to play with in the warmer weather? He’s looking a little shifty in this picture 😉 But I’m sure he’s a sweetheart and he just needs a binky to cuddle with? He needs a buddy. I guess until then the blankets help occupy his time. Maybe head to the thrift store and pick him up a blanket to play with. He’s actually being turned out in a group during the day. He just does it at night when he’s looking for trouble!